When considering breast implants, one shape (or size) does not fit all. Patients are well aware that implants are available in two major categories: saline or silicone. Most patients are not aware, however, of the various shapes of implants to consider. 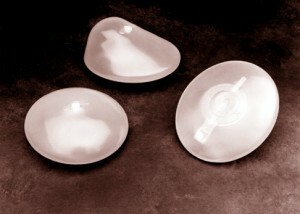 Most implants used for breast augmentation are round, whereas a smaller percentage have a “teardrop” shape. The “teardrop” implants, sometimes referred to as “anatomic” implants, are thicker (project or stick out more) towards the bottom of the breast, and thinner (project less) at the top of the breast. In theory, this could provide a more natural breast shape. In actuality, other factors are far more important in determining whether the breast appearance looks “natural.” Round implants don’t mean that the breast will look round. If the space for the implant (the implant pocket) is created properly, and the size chosen is appropriate, the round implant can provide an extremely natural appearance. I’ve stopped using the teardrop implants in recent years, mainly because the teardrop implant must have a textured, or rough, outer surface. The textured surface is necessary to keep the implant from rotating in the pocket, which might put the thicker and thinner parts of the implant in the wrong places. In my experience, the textured implants don’t settle into the breast as easily and naturally as the smooth implants. As a result, I mainly use smooth round implants. It doesn’t matter if a round implant rotates in the breast pocket, since this would not affect breast shape. The “art” of breast augmentation involves consideration of implant texture, shape, and size among many other factors. Every patient is unique, and requires an individualized assessment and plan to achieve the best possible results from surgery. During your consultation, I’ll discuss these and other issues and decisions that will help you to achieve the appearance you’ve dreamed about. Andres Taleisnik, M.D. is a board certified plastic surgeon in Orange County who offers a wide range of cosmetic plastic surgery procedures, such as liposuction, tummy tuck surgery (“abdominoplasty”), breast lift surgery, and breast augmentation surgery. To learn more, contact Dr. Taleisnik to schedule a complimentary consultation.